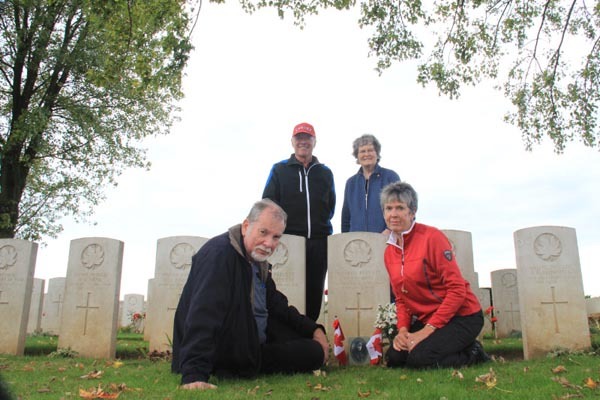 On October 6, 2013, Orland French and Patricia Chernesky, nephew and niece of Pte. 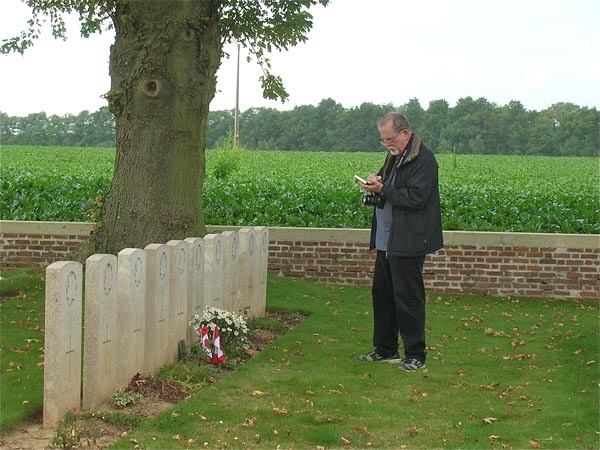 Oscar French, visited his grave in Nine Elms Military Cemetery, Thelus, France. They are the children of Elmer, Oscar's young brother and were accompanied by their spouses, Sylvia and Richard. Like all Commonwealth War Graves sites, Nine Elms is an immaculate burial ground. The cemetery, surrounded by a low brick wall, is bordered on three sides by a turnip field and on the fourth by a modern four-lane expressway. 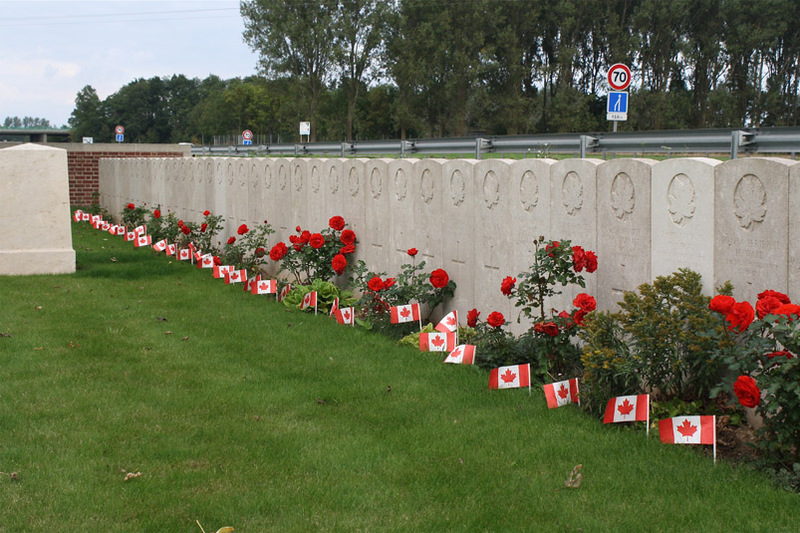 It is located near the village of Thelus, which is on the south-western slope of Vimy Ridge. On the morning of April 9, 1917, Canadian Divisions One and Two were attacking the southern end of the ridge. Oscar was killed by shellfire near the village of Thelus. 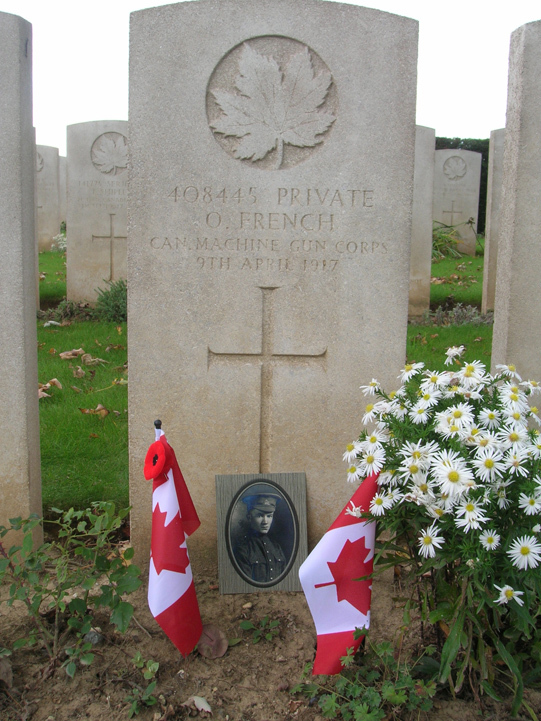 He is buried next to Joseph Defayette, who was killed by the same shellburst. Front, Orland French and his sister Pat Chernesky at the grave of their uncle, Pte. Oscar French. Back, Richard Chernesky and Sylvia French. Thelus was taken by the Canadian Corps on April 9, 1917, the opening day of the Battle of Vimy Ridge. This cemetery, which was named after an elm copse, contains the graves of 155 British, 529 Canadian and 54 French soldiers who fell in the capture of the ridge and during subsequent fighting. Nearly 750,000 Commonwealth soldiers, sailors and airmen died on the Western Front – 200,000 in Belgium and 500,000 in France. They are commemorated upon headstones marking graves in over 1,000 war cemeteries and 2,000 civil cemeteries, or on one of the six memorials in Belgium and 20 in France which carry the names of more than 300,000 who have no known grave. From a plaque in Nine Elms Cemetery.